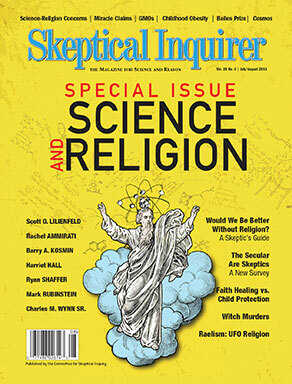 In a Skeptical Inquirer article that I’m a bit surprised hasn’t received more attention, Scott O. Lilienfeld and Rachel Ammirati take a look at this question: Would the World Be Better Off Without Religion? A Skeptic’s Guide to the Debate – CSI. In this article, we address the overarching question of whether high levels of certitude are warranted among partisans of either position. In the interest of full disclosure, both authors of this article are atheists. At the same time, we have become concerned by what appears to be unjustified dogmatism by both religious skeptics and believers in discussions concerning an exceedingly complex and multifaceted question. Therefore, we attempt to demonstrate that (a) scientific data bearing indirectly on the question have routinely been neglected by many individuals on both sides of the debate; (b) such data, although informative, do not permit anything approaching conclusive answers to the question of whether religion makes the world a better or worse place. At the same time, such data cast serious doubt on broad-brush contentions (e.g., Dawkins 2006) that religion is usually or always associated with a heightened risk of immoral behavior, including violence. Hence, we view our article as a modest call for greater epistemic humility on the part of ardent defenders of both positions. This article is a long one, but informative, and if you have strong opinions on this subject, I encourage you to read the full thing. I think the problem with saying that religion is good or bad is how amorphous that statement is. We can’t even succinctly define religion, at least not in a way that includes all the movements usually accepted as religious. In many non-western cultures, the dividing line between that culture’s religion and the rest of the culture is non-existent, meaning that their religion is their culture. Are there evils committed in the name of religion? Undoubtedly, and there are plenty of examples. Are there beneficial acts inspired by religion? Also undoubtedly, also with plenty of examples. Another way to think of this is, are there evils committed by cultures? And are there good acts inspired by cultures? Again, the answer for both must be yes. Yet I’ve never heard anyone condemn the overall idea of culture. This later snippet in the article I think gets at the position that many atheists hold, either explicitly or implicitly. Some nonbelievers may react to this debate by staking out an alternative position: as scientific thinkers and skeptics, we should be seeking the truth, the consequences be damned. From this perspective, if God does not exist, we should be discouraging uncritical acceptance of religious tenets regardless of whether they exert beneficial or detrimental long-term effects on society. Knowledge, Sir Francis Bacon asserted, is power. In our view, this position is both intellectually consistent and intellectually honest, and we see merit in it. At the same time, advocates of this position need to be forthright in acknowledging that it may entail unknown risks that need to be weighed in public discussions of the value of religion to society. Actually, I think I recall Dawkins taking this position explicitly. I have to admit that this used to be my position, although I’ve come to think that it’s probably a position of privilege. Many of the most religious people are religious because they need the existential comfort that their religion provides them, often because their lives are uncertain, sometimes because their life is dangerous and desperate. I’m far less comfortable than I used to be with the idea that these people must be disabused of their beliefs. The standard anti-theist talking points are that removing those beliefs would encourage people to better themselves, that anyone uncomfortable with the idea of convincing them out of their faith is simply being a patronizing snob. None of this is to say that I think atheists shouldn’t try to sell their worldview, or that clearly dangerous or repressive religious beliefs shouldn’t be challenged. But we should realize that atheism, like much of skepticism, is an emotionally expensive proposition. Those of us who can afford to accept such propositions should be careful not to be cruel to those who cannot. And as I’m sure many believers will point out, we can’t prove that some version of God doesn’t exist, at least except for the fundamentalist versions. Whether or not to believe in one of those versions is a philosophical conclusion, and like all philosophical choices, it’s a personal one. This entry was posted in Religion and tagged Atheism, Dawkins, Francis Bacon, God, New Atheism, Religion, Religion and Spirituality, Richard Dawkins, Scott O. Lilienfeld. Bookmark the permalink. 22 Responses to Would the World Be Better Off Without Religion? Very thought provoking. Is it better for people in tough situations to believe that God is on their side, that their prayers work? Perhaps that touching some holy relic will cure their diseases? That good wins and evil is punished? You could take this argument further and say that it’s actually helpful for the poor and disadvantaged to believe in witches, magic, good luck charms and so on. I prefer to think that religion and superstition takes advantage of the most vulnerable in society. The dying, the bereaved, those in danger, etc, etc often turn to religion in their hour of need. Perhaps it’s a comfort, but it seems sinister to me. Paedophiles, sexual predators and con artists also take advantage of such people, supplying superficial comfort but exacting a high toll. Thanks. I don’t necessarily disagree with anything you wrote, but I’m very aware that we live in a very imperfect world. We often have to settle for the lesser evil. In some cases, false beliefs are clearly dangerous and should be challenged. In other cases the cost and benefits are far less clear, as the article discusses. I agree that the question is not easy to settle, and our minds should be open. However I do think it is defensible to hold an opinion on the question either way, as long as you don’t cling to one viewpoint dogmatically. Personally, I suspect that religion is past its usefulness and we would be better off if we abandoned it. I don’t think that the difficulty of defining religion is a real problem, because we can articulate the question in other terms. We can ask whether it is beneficial for a society to systematically inculcate beliefs which have no basis in evidence or whether it is helpful for individuals to believe in the supernatural. This may exclude some religions from the question, but these borderline religions are perhaps not the institutions anti-religionists are interested in opposing. I think religion is harmful because I think false beliefs, though comforting, can lead people to act in ways that are against their own self interest and against those of others. It leads to unnecessary guilt about sexual matters, the unnecessary prolongation of suffering of those with terminal diseases and the unnecessary hatred or fear of those who are of different faiths or sexual orientations. Different false beliefs will lead to different consequences, of course, so we should not over-generalise, but I think as a heuristic it is usually better to be equipped with the truth. In order to know how best to act to help ourselves and each other, we need to know the facts, and religion too often hinders this in my view. We may be losing short term comfort but I think we stand to gain in the long term. But while I think society is likely to be improved by a gradual phasing out of religion, I would also share your reluctance or discomfort in attempts to disabuse individuals of comforting privately-held false beliefs. If there is evidence that religious societies are better off, then I’m ready to be proven wrong, and in this case I would not insist as some might that the truth is more important than well-being. From what I’ve seen, attempting to convince people out of religion without that first step is mostly going to be fruitless. The question for me is how to treat people that we can’t do that first step for. Ridicule and polemics strike me as exactly the wrong approach (and it sounds like we agree on that). Brings to mind that ‘thunk’ at HuffPost used to say that religion is an expression of our social nature, ie more effect than cause I think. Interesting post by Stenger. I think he gets the correlation backwards. He implies that religion causes poor standards of living. He doesn’t seem to consider that religions thrive in poor standards of living and weaken when those standards improve. I’m skeptical of God, but I’m also skeptical of comparisons with things like FSMs, invisible green dragons, celestial teapots, or other contrived examples. These comparisons have a hidden assertion, that non-childish conceptions of God are equivalent to them. More intellectually honest comparisons would be idealism, platonic forms, strict determinism, or other metaphysical notions. Like a non-interventionist god, these things can’t be proven or disproven, despite the emotional commitment that many people have toward them. You are unusually self aware in that assessment. I can understand that position. I’m compelled to seek the truth, but I fully understand that compulsion comes from a position of someone fortunate to live a relatively comfortable life. I can’t honestly say I’d be confident it would endure if my life suddenly became harsh and uncertain. If it did, intellectual truth may not be nearly as important to me. I’m always fascinated in this topic of truth and happiness…thanks for bringing it up! I’m not sure we can will ourselves to believe in things that we know aren’t true (well, I can’t…I shouldn’t speak for everyone), but in the case of religion and God, there’s a lot more uncertainty. What about when we don’t know or if we know we can’t know? I think this is where we’re at, in epistemically neutral territory. This territory opens doors for some people, others just shrug their shoulders, others claim we shouldn’t believe, for whatever reason. I think in light of uncertainty, people part their ways according to temperament. And Mike, as you say, atheism is emotionally expensive, and some just can’t afford it. Something I rarely hear mentioned is that in real life—probably outside of theological discussions—people take happiness as a kind of truth-indicator, though not in any strict logical sense (although there are those too, unfortunately). There’s a sense that when you’re happy, you’re on the right track. It’s not so much that the truth doesn’t matter, but that harmonious feeling is indicative of something greater, being “tuned to nature” or the universe. (Sorry about the cliches.) It is possible to take this feeling for what it’s worth, as something that’s meaningful but not certainty or Truth itself. As I said, logically, happiness and truth are not the same. It’s not that “the proof is in the pudding,” but if the proof is nowhere in sight, it’s understandable that some would choose to go for the pudding sans proof. The pudding analogy reminds me of the movie ‘Life of Pi’, a movie that starts off with the claim that it’s a story that will make you believe in God. Most nonbelievers I talked with usually find the ending pretty dark, while most believers I know seem to find it uplifting. It’s almost like a rorschach test for your propensity to be religious. I haven’t seen the movie, but I read the book and was convinced that it was an atheist work demonstrating the absurdity of religion! That was my reaction to the movie. I have a hard time understanding how believers see it otherwise, but many do. I need to check out that movie! That sounds amazing. It would be interesting to have a party with a mix of believers and nonbelievers and everyone in-between to see what everyone’s reactions are. This reminds me of the movie “All is Lost” with Robert Redford. The ending is ambiguous and people interpret it differently, although I’m not sure that interpretations of it depend on religious leanings. I interpreted it in a religious way, but I don’t consider myself religious. Anyways, when I talked to my husband about the ending afterwards, he couldn’t even see the ending that I saw until I pointed it out to him. We actually had to debate whether it was ambiguous! Hmmm. I haven’t seen ‘All is Lost’ yet. You’re making it sound interesting. To be fair, it can be a little tedious. There’s almost no dialogue. It’s a guy lost at sea all by himself, so you get to watch him doing things to save himself throughout the whole movie. There’s another thing that annoyed me about it, but I don’t want to spoil the plot. Still, it’s worth seeing. Plus you can talk over the film without missing anything. That actually matches the impression I got from the trailer, which is why I haven’t seen it yet. Maybe one day when I’m bored. Great points. I am fascinated by the links between belief and happiness, especially since I believe that certain types of beliefs are causal with respect to happiness. Can we believe that which we know not to be true? I don’t know. Are there ways of working with beliefs to improve happiness? I think so. I think there is plenty of historical evidence that we can. People seem to do it regularly, even when they’re trying their hardest not to. The real question is, can we consciously elect to do it? I remember reading somewhere Pascal (of “Pascal’s wager”) advising nonbelievers to immerse themselves in religious ritual in order to foster belief, a sort of self indoctrination. I suspect if someone does that, they have a shot at making it happen. Although it’s hard to imagine someone doing that if they didn’t really want that belief, or weren’t perhaps being forced into it. Personally, I’m a lot more comfortable with people finding comforting and meaningful beliefs that are at least possible given scientific facts. Yeah, I’ve been wondering about the question of whether we can believe something we know isn’t true. I think in a certain way, yes, but that would involve not really “knowing” that something isn’t true. It might involve a complicated psychological process. You have to wonder about certain folks who can continue to deny things in the face of clear evidence. What’s really going on there? I don’t know. As for working with beliefs to improve happiness, I think it’s definitely possible. A lot of times we color our beliefs to render what would be a neutral fact either positive or negative. Glass half full, glass half empty. We might believe something to be true, and it might be appropriate to do so, but how we perceive that belief has a lot to do with happiness. And even with beliefs that are not so neutral, there’s wiggle room there too. Most beliefs fall under various levels of certainty and sometimes we don’t accord that belief the right level of certainty. Some folks feel more certain of some beliefs precisely because these beliefs are negative. The bumper sticker version is: “It’s too good to be true”. And of course the opposite happens too, although I see the former more often. This is faulty reasoning. It’s simply not true that bad things are more likely to be true. I’m a fairly pessimistic person and I know that I tend to fall into this trap. (Pessimism has the benefit of lowering expectations and thus allowing oneself to be pleasantly surprised, but a lot of beliefs don’t allow for this kind of payoff because the truth doesn’t become known in a timely way or at all.) If we take a look at the belief in a less black and white way, we might ask, “How MUCH do we believe x?” and we might find that we believe x too much or too little based on the actual evidence given. Recognizing this could change our happiness in a very meaningful way because we recognize that we haven’t really been all that rational after all.